In one of the most boring Super Bowl games in recent memory, marketers played it safe and avoided politics, controversy or surprises. 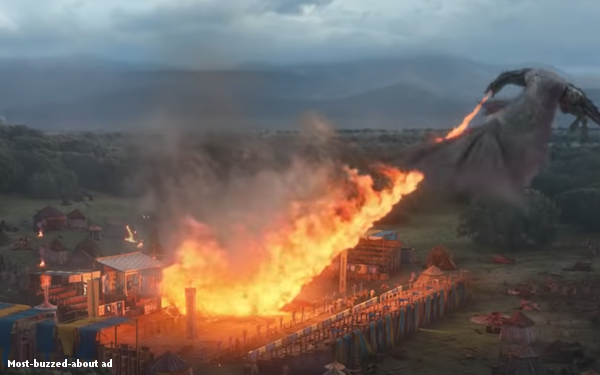 The lone exception was Bud Light’s crossover ad with HBO’s “Game of Thrones,” in which the Mountain slays Bud Knight and Daenerys Targaryen’s dragon barbecues the crowd. The spot earned more buzz on social media during the game than any other, says Kellan Terry, who manages PR data for Brandwatch. “We’re calling it the 'Play It Safe’ Bowl,” says Jonathan Lewis, partner and strategy director for McKee Wallwork + Co., which runs Ad Bowl. “Ads were either funny or sentimental, and that’s been successful in the past,” he says. The closest any brand came to politics was a Budweiser’s “Wind Never Felt Better” ad, which started with a closeup of a Dalmatian and team of Clydesdales, before showing a surrounding wind farm. “It started on an emotional note, and then ended with this weird policy statement about wind power,” says Lewis. Ad Bowl ranks commercials on the total number of views they’ve had so far, to capture the reach of ads in before, during and after-game views, updating the ranks every 10 minutes. So far, Amazon’s "Not Everything Makes the Cut" is way out in front, with 33 million views, followed by Hyundai’s “Elevator,” starring actor Jason Bateman. Budweiser’s wind spot comes in third. Terry says Bud Light, which ran spots throughout the game, in addition to the “Game of Thrones” spot, also generated some controversy with ads featuring a cask of corn syrup, throwing shade at the ingredients of other brewers. Brandwatch says the most positively discussed brand were Avocados from Mexico, with 97% of mentions positive, followed by the NFL, with over 94% positive, and then Bubly, Persil ProClean, Planters and WeatherTech, all with mentions that ran about 90% positive. Turbo Tax got the most negative mentions, at 81% (with many people thinking the robot child was creepy), Stella Artois and Mint Mobile. All brands that advertised during Super Bowl LIII have been mentioned more than 336,000 times on Twitter, Facebook, Instagram and Reddit, Brandwatch reports. The New England Patriots defeated the Los Angeles Rams 13 to 3, making it the lowest-scoring Super Bowl in NFL history. Just three points were scored in the first half and three more in the third quarter. The halftime show didn’t add much spark, either. “Maroon 5's Super Bowl halftime show tasted like fear,” wrote the Los Angeles Times.